My Pinnacle Network recognizes region’s best connectors with Networking Ninja Awards. – My Pinnacle Network . Others nominated for awards include: George Rolfing of Brookline Transportation; Itamar Chalif of Rockland Trust; Robert Viamari of Cape & Plymouth Business Magazine; Roy Pacitto of Bryley Systems; Steve Wilson of Office Furniture Consulting; Dave Flaherty of Aflac; Sheldon Prenovitz of ABResources; Bill Tkowski of FMC Partners; Matthew Mensch of Law Office of Matthew Mensch; Lois Drukman of Walter May Insurance; Neil Policow of Leaderboard-Boston; Nicole Connolly of PhotoFabulousYou.com; Pam Snell of ACTSmart; Will Shain of TAB; Michael Mills of Business Coaches and Associates; and Murray Vetstein of Source4. 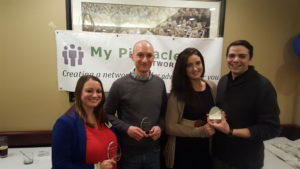 Awards were distributed to the winners at a joint networking event hosted by the South Shore Professional Networking Group and My Pinnacle Network on March 22 at the Cask & Flagon in Marshfield. The event was held during South Shore Professional Networking Group’s regular meeting night, the third Tuesday of the month. “We can’t thank Lois Drukman, Mark Roos and the rest of the South Shore Professional Networking Group for sharing their meeting night for our awards ceremony,” noted Dubin. “Networking really starts with giving and the SSPNG team exemplifies that philosophy.” My Pinnacle Network hosts business-to-business networking groups in the towns of Bourne, Braintree, Mansfield, Marshfield, Newton and Westborough. For information about My Pinnacle Network, please visit www.MyPinnacleNetwork.com, or contact Steven V. Dubin at SDubin@MyPinnacleNetwork.com or 781-582-1061. My Pinnacle Network recognizes region’s best connectors with Networking Ninja Awards. My Pinnacle Network, the business to business networking group with monthly meetings in Bourne, Braintree, Mansfield, Marshfield, Newton, and Westborough, MA, recently announced the winners of its third annual Networking Ninja Awards. The Networking Ninja Awards were created to recognize the region’s best networkers in four separate categories: Best Connector (helping bring people together); Most Ubiquitous (appears to be at every networking event); Most Altruistic (does most for others); and Brightest Beacon (adds energy to networking events). Jim Hickox, owner of Apple Corps Cleaning Service of Weymouth took home the honors as Best Connector. He is a member of My Pinnacle Network-Braintree Third Thursday. Michelle Resendes of Cape Cod Broadcasting Media in Hyannis won the Most Ubiquitous Networking Ninja Award. She is a member of My Pinnacle Network-Bourne. David Allen, owner of Balance Wealth Advisors in Wellesley won the Most Altruistic Networking Ninja Award. He is a member of My Pinnacle Network-Westborough and My Pinnacle Network-Newton. David DeBlasio of DeBlasio New Media Marketing in Dedham won the Brightest Beacon honors for the second consecutive year. He is a member of My Pinnacle Network-Mansfield. Voting for the Networking Ninja Awards took place from January 1 through February 28 on the My Pinnacle Network website, www.mypinnaclenetwork.com. Others nominated for awards include: George Rolfing of Brookline Transportation; Itamar Chalif of Rockland Trust; Robert Viamari of Cape & Plymouth Business Magazine; Roy Pacitto of Bryley Systems; Steve Wilson of Office Furniture Consulting; Dave Flaherty of Aflac; Sheldon Prenovitz of ABResources; Bill Tkowski of FMC Partners; Matthew Mensch of Law Office of Matthew Mensch; Lois Drukman of Walter May Insurance; Neil Policow of Leaderboard-Boston; Nicole Connolly of PhotoFabulousYou.com; Pam Snell of ACTSmart; Will Shain of TAB; Michael Mills of Business Coaches and Associates; and Murray Vetstein of Source4. Awards were distributed to the winners at a joint networking event hosted by the South Shore Professional Networking Group and My Pinnacle Network on March 22 at the Cask & Flagon in Marshfield. The event was held during South Shore Professional Networking Group’s regular meeting night, the third Tuesday of the month. My Pinnacle Network hosts business-to-business networking groups in the towns of Bourne, Braintree, Mansfield, Marshfield, Newton and Westborough. For information about My Pinnacle Network, please visit www.MyPinnacleNetwork.com, or contact Steven V. Dubin at SDubin@MyPinnacleNetwork.com or 781-582-1061.